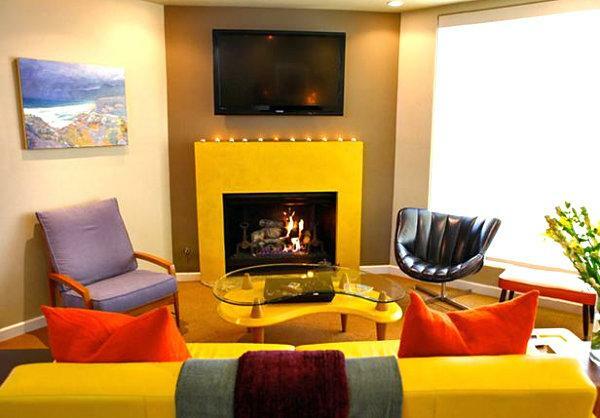 Color is an effective way to change your interior design and decorating, influence your emotions, health and mood. 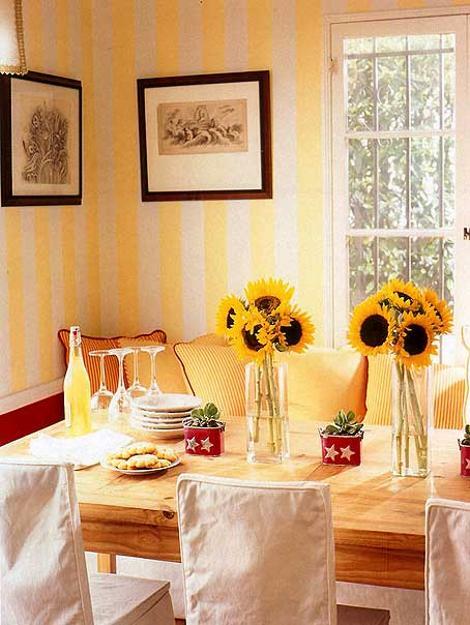 Many people are better and more joyful in room decorated with yellow colors that feels like a sunny day. 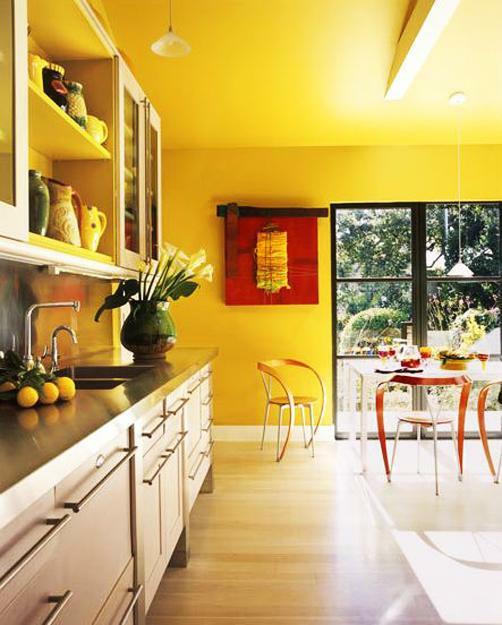 People require light and sunshine to be fit and healthy, and yellow color tricks human eyes and brain into interpreting yellow interior decorating as sunny and warm day. 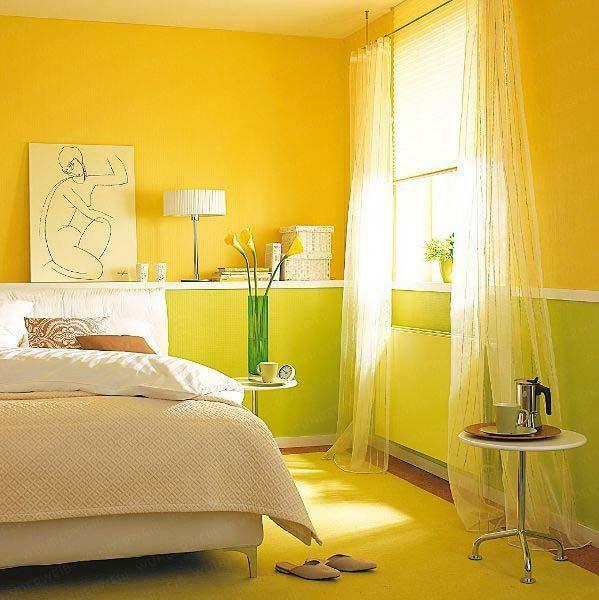 Yellow color shades help to fight illness, it stimulates nerves. 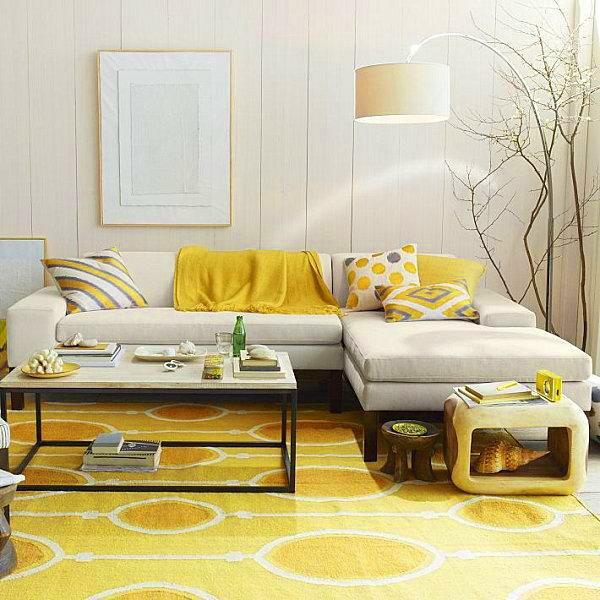 Interior design and decorating with yellow colors influence mood to be happy and optimistic. 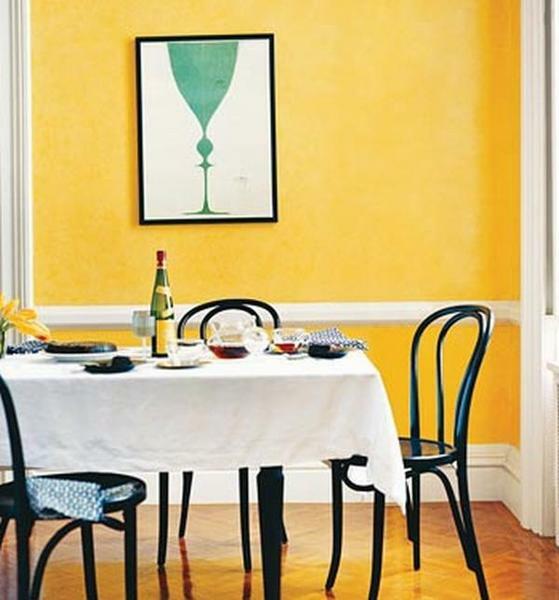 Yellow walls in your house lighten up rooms. 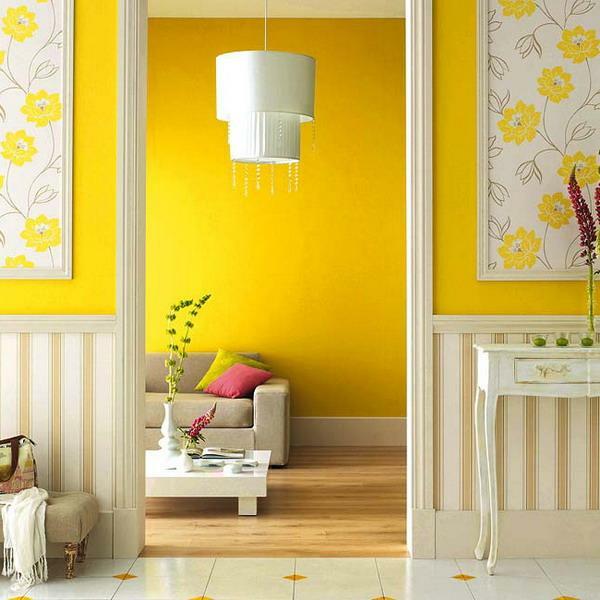 Yellow paint, wallpaper patterns with yellow details and wall decorations in golden colors look bright and warm. Decor accessories in yellow colors and beautiful yellow flowers enhance your family health and transform interior design and decorating with warmth. 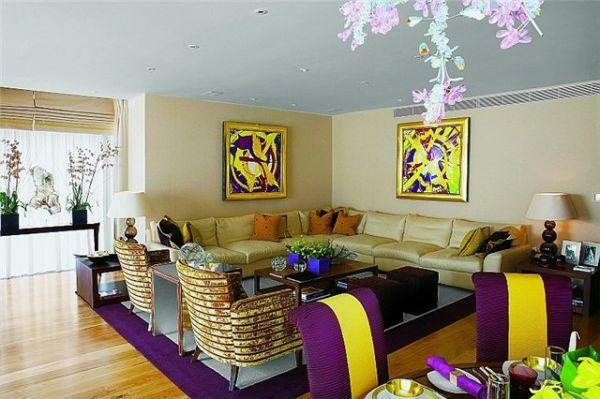 Modern interior design and decorating with yellow color shades, especially golden colors, feel successful, radiant and very attractive. 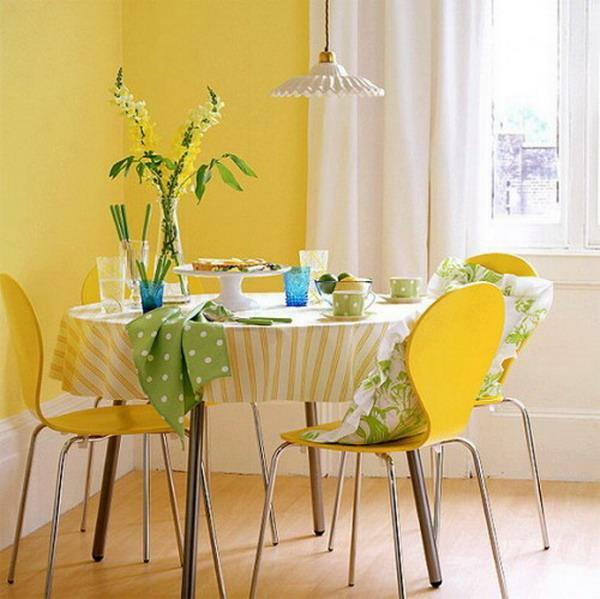 Yellow paint, wallpaper patterns, furniture upholstery fabrics and decor accessories in yellow color can make the viewer feel affectionate, productive and successful. 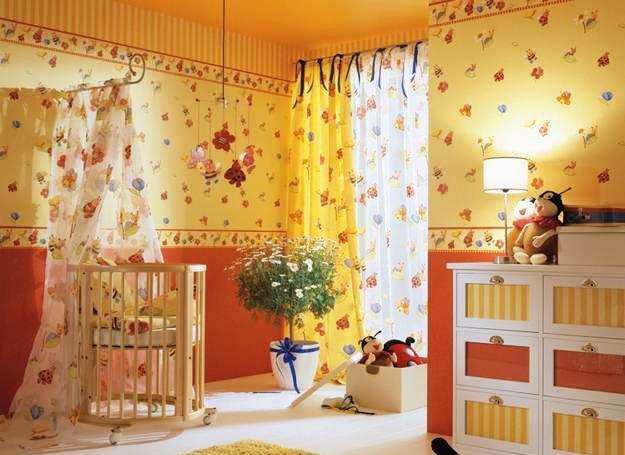 Interior decorating with yellow color affects little kids also, and is suitable for children bedroom designs, kitchens and family rooms. Yellow food and yellow flowers are the simplest ways to apply color therapy in your daily life. Yellow foods, like pineapple, bananas, corn, and squash, are fresh and nutritious choices. Yellow flowers, like sunflowers, chrysanthemums, roses, tulips, irises, Daylily, Marrigold, pansy, narcissus and primula flowers are beautiful and bright choices for interior decorating and your garden. 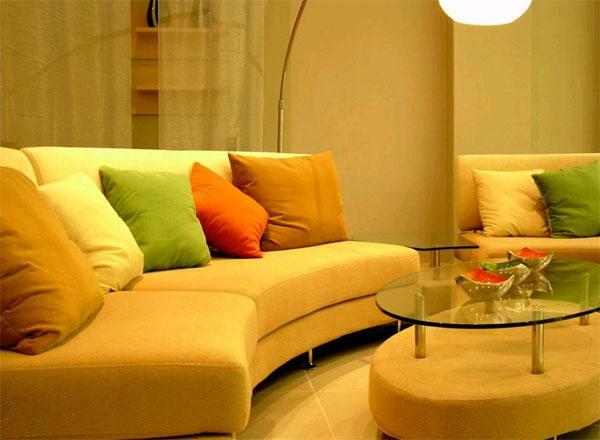 Yellow colors used for interior design and outdoor home decor boost the feeling of well being and self esteem. People feel better and fit with the influence of these wonderful decorating colors. Yellow color represents optimism, hope and success. 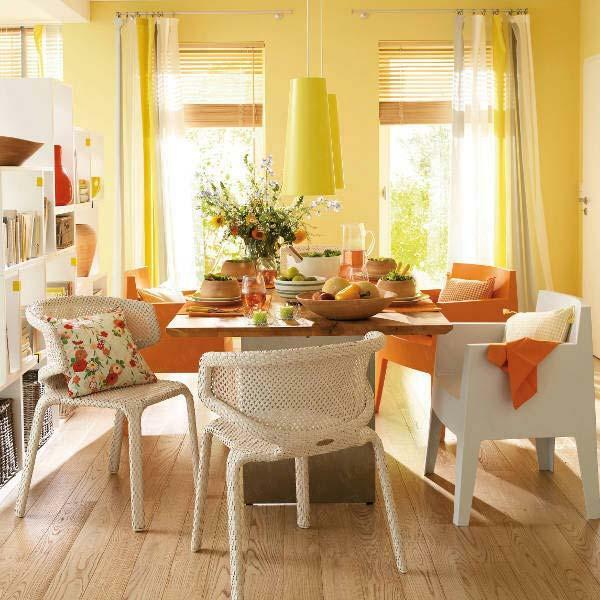 Bright, warm and modern interior design with yellow colors is a great way to create your own hope and lift spirit. 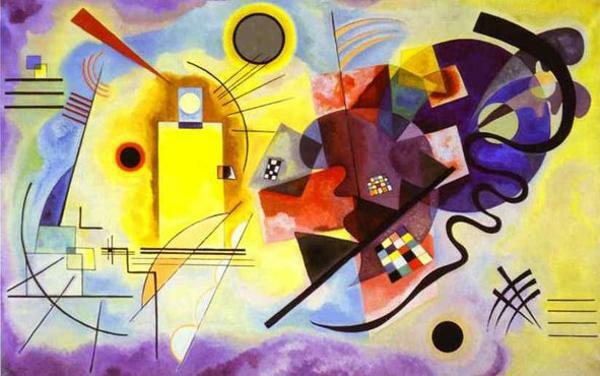 Yellow color is an intellect color that will be very improves concentration and speed up leaning process. 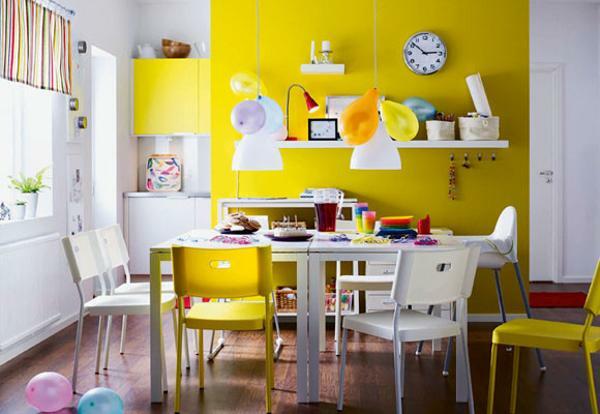 Great for kids room design, yellow color brings sunshine, energy and productivity into living spaces. However, yellow walls can make babies cry more often. 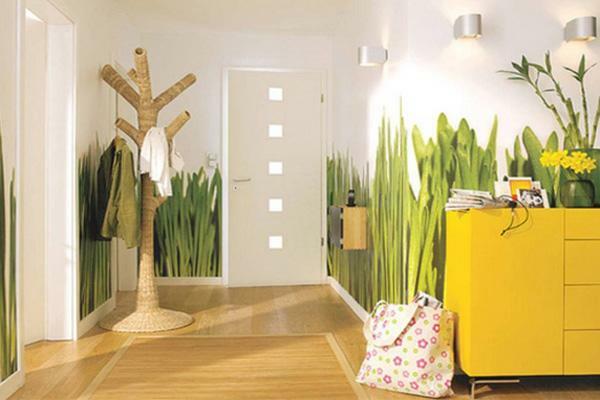 Pale and light yellow color shades, pastel yellow, creamy and champagne tones are ideal for young kids rooms. 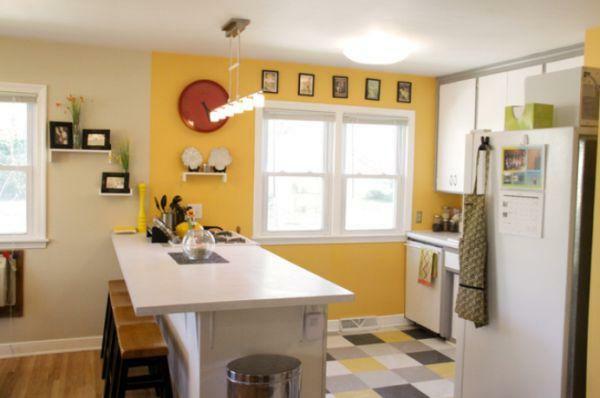 Harsh and bright yellow can be reserved for sunny accents. Used in moderation, yellow colors create bright and energizing interior design and decorating without creating an overwhelming effect. Yellow paint colors, modern wallpaper patterns with yellow details, furniture upholstery and home decorating fabrics in yellow look great paired with cool, dark or neutral colors. 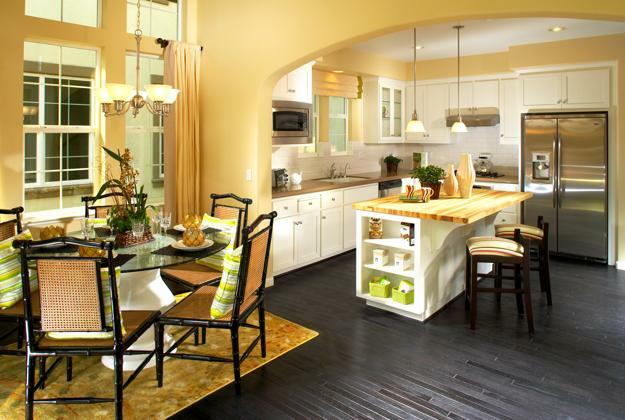 Yellow and black creates strong contrasts which asks for calming and relaxing details. Modern interior design and decorating ideas that mix yellow with green, blue, pink, purple, red, white and brown colors, evoke a sense of stability and optimism. 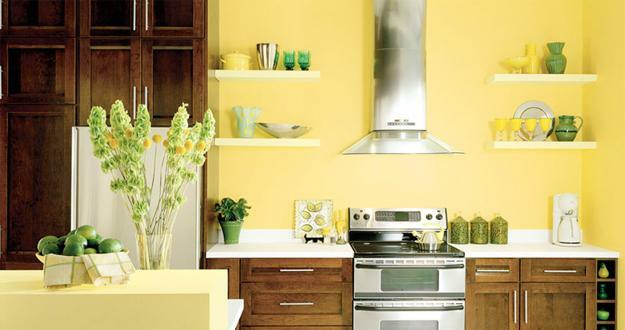 A touch of yellow brings fun, creating playful, youthful and bright interior design and decorating color schemes. 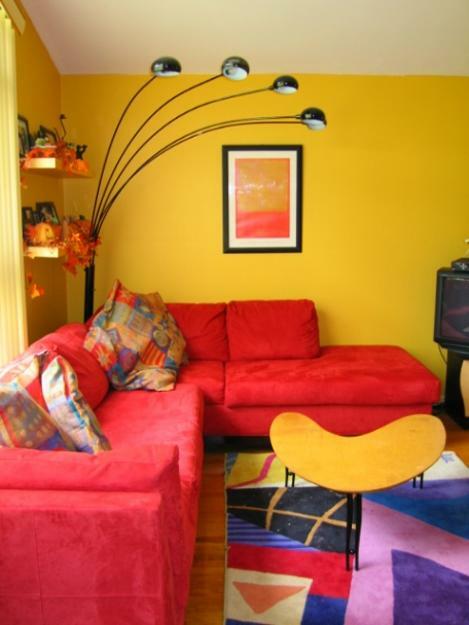 Rich yellow color shades are wonderful for adults and kids room decorating. Rich yellow colors of sunflowers and fall leaves add charming hues to interior decorating and create warm rooms where you and your family feel cozy and happy. Interior design with yellow can be really fun and modern if you use yellows in moderation and correctly. 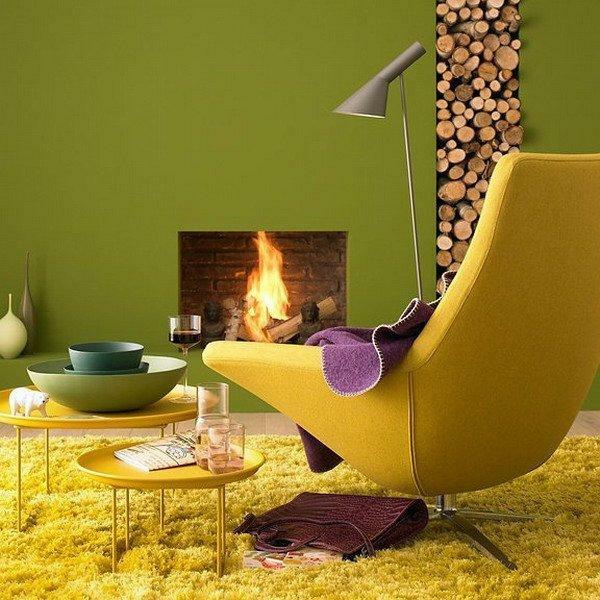 Your instinct will help to select yellow paint colors and modern wallpaper patterns with yellow details, furniture and home decorating fabrics, small accessories and home decorations in yellow and golden colors that will look perfect in your home, turning rooms into sunny, bright, stylish and comfortable living spaces.